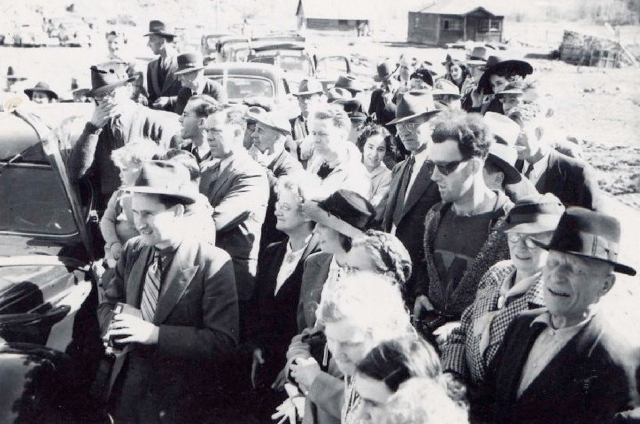 Can you spot the Time Traveler? 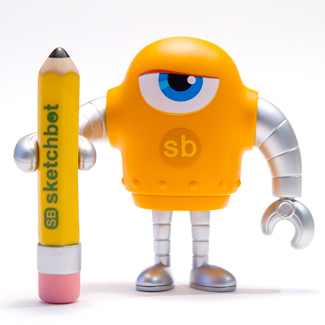 We’re lovin the sketchbot platform! Check out this DIY toy and other variations by Steve Talkowski. We plan on gettin a few of these! 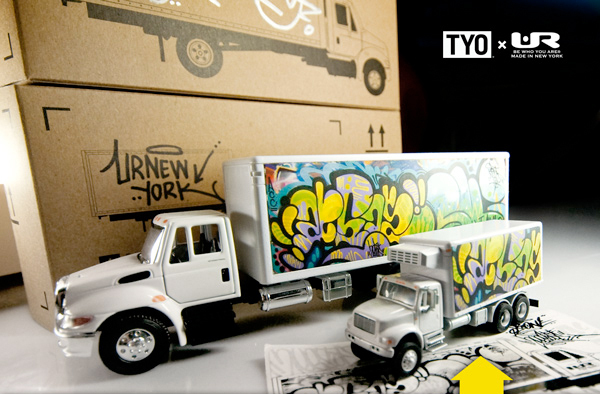 An urban vinyl toy is a medium where art is exhibited as a toy in limited editions. 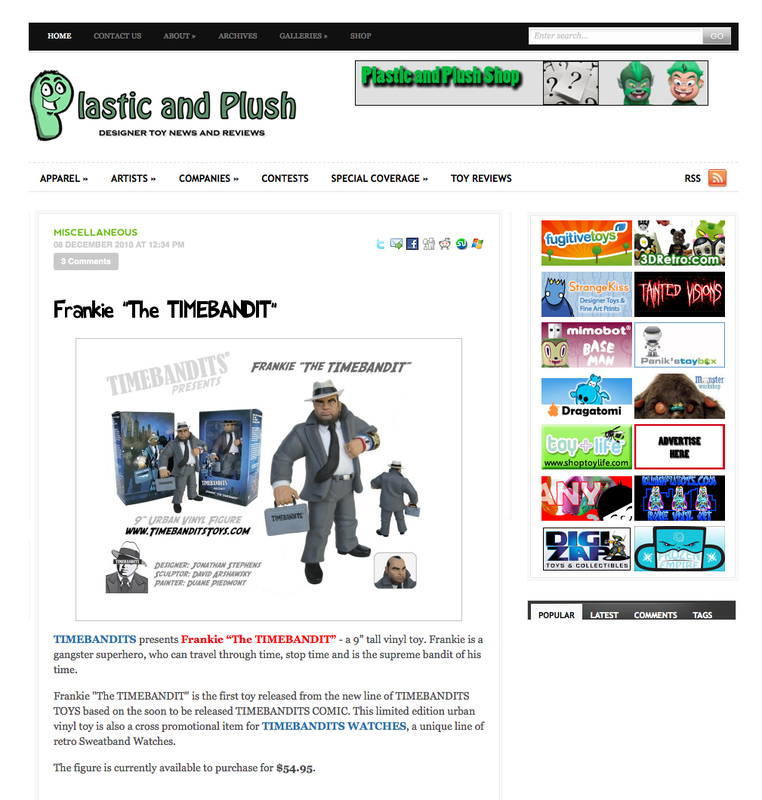 Artists use this kind of collectible toy as a platform to make their art more affordable. In stead of paying $20,000 for an original Pop Surrealism/Lowbrow Art painting, why not just pay $50-$100 for a limited edition toy and add that piece to your ART collection? 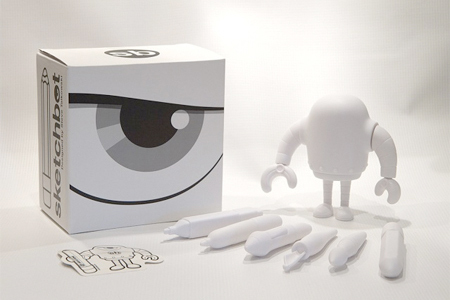 An urban vinyl toy is made of soft vinyl that is hollow on the inside like a rubber duck. Soft vinyl figures are made of soft PVC which are produced by a process called rotocasting or centrifugal casting. This kind of rotocast process consists of placing small amounts of plastic into a steel mould, then spinning it really fast forcing the plastic into the details on the walls of the mould leaving the middle of the mould hollow. Rotocasting is less expensive than using other plastic casting methods like injection moulding because you’re using less plastic to produce the hollow figures. This cheaper method of toy manufacturing is very appealing to artists who want to make small quantities of limited edition toys at a lower cost. They are also more lightweight which decreases transportation costs. Where did the idea of creating urban vinyl toys come from? The concept of urban vinyl was pioneered by an artist named Michael Lau, who first created urban vinyl figures in Hong Kong in the late 1990s. 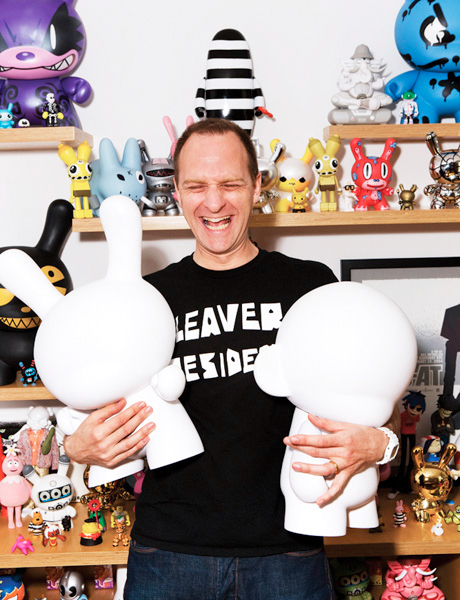 Other artists who started creating urban vinyl figures included Japanese artist/designer Takashi Murakami, Australian designer Nathan Jurevicius (Scarygirl), Los Angeles based Craig Anthony Perkins (Broken Heart Robot), and former graffiti artist KAWS. Soon after the urban vinyl toys were pioneered by these innovators, many other artists have been creating their own designer toys such as: Frank Kozik, Gary Baseman, Tim Biskup, Robert Williams, Brandt Peters, Buff Monster, Devilrobots, Dalek, Joe Ledbetter, Huck Gee, Muttpop, Mori Chack, Paul Budnitz (KidRobot), Ron English, Sket One, Steven Lee & Raymond Choy (Qee), Simone Legno (Tokidoki), and many others around the world. Urban vinyl is a product of urban, hip hop and youth-oriented pop culture. There are two classifications of urban vinyl: Eastern Vinyl, including anything designed and produced in Asia or Australia, or Western Vinyl, pieces designed and produced in North America/South America, or Europe. 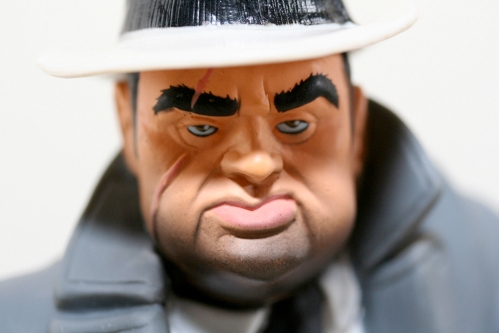 Urban vinyl toys have become highly sought after collectible items. 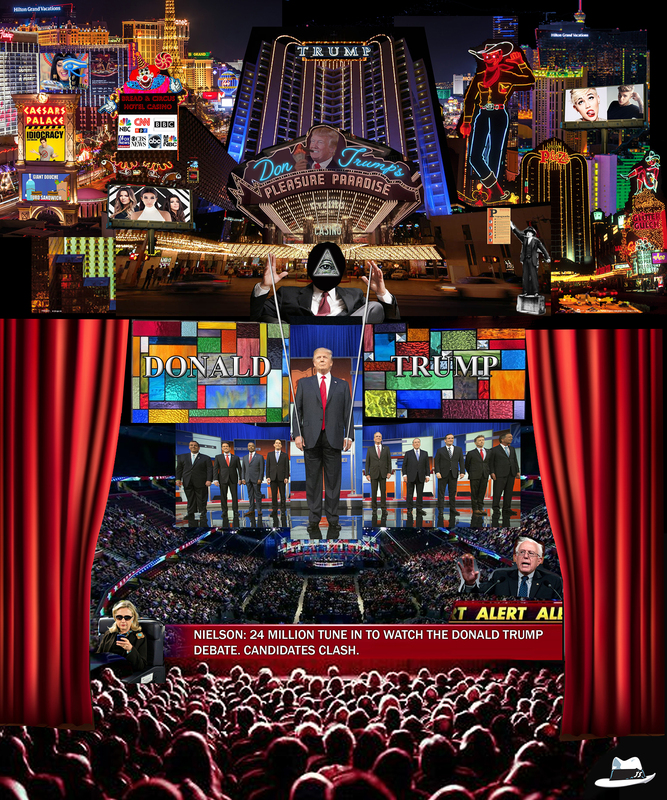 Some of the more rare pieces may sell for hundreds or even thousands of dollars. The urban vinyl toy movement has become a phenomenon launching a global art toy-collecting community.